3DBear allows students to design and create mixed-reality scenes, then bring their models to life using a 3D printer to create three-dimensional scenes. Teachers can create transformational learning experiences for students by joining 3DBear’s AR Innovator Program. The program includes in-classroom professional development sessions. For a limited time, 100 schools can receive a grant for 50% off the program fee. The program runs from May 2018-June 2019. Schools can join until September 2018. Age of Learning announced new upgrades to ABCmouse for Teachers, which is offered at no cost to teachers for use in their classrooms. This program adds full home access for students, custom curriculum alignment, performance reporting, professional development, and more. In addition, ABCmouse has shared releases and updates for ABCmouse Mastering Math, Digital Library Experience, Standards-Aligned Collections, A New Teacher Experience, and the ABCmouse Ambassador Program. Measured Progress and AdvancED will join forces to form a unique and far-reaching nonprofit educational company focused on data-driven tools for school improvement. The merger will create a $120-million nonprofit organization with 500 employees. Serving at least 28 million students in more than 40,000 schools in every state and in more than 70 nations, the new organization represents a meeting of the minds and of complementary areas of skill and experience. Amplify announced it is entering the supplemental market with the launch of two programs, Amplify Close Reading and Amplify Fractions. Amplify Close Reading is a digital graphic novel that engages students in a suspenseful story while helping them master close reading skills covered by ELA standards in grades 6–8. Amplify Fractions covers math standards in grades 3–6 and uses adaptive learning, interactive storytelling, and a personalized digital tutor to help students conquer fractions. Bloomz unveiled its new student accounts, providing teachers, schools and districts with an all-in-one communications platform that ensures security and privacy and boosts engagement. This new feature gives students the opportunity to receive messages, updates, alerts, notifications, photos and videos directly from their teachers and schools, empowering them to take greater ownership in their learning. Starting in August, teachers can invite students to sign up for a free Bloomz account to use the app. Califone International announced Bluetooth Jackbox and two new series of headphones and headsets, which will feature newly enhanced CaliTuff cords. The 1216BKBT Bluetooth Jackbox provides a cost-efficient way to stream audio from a smartphone, tablet or other Bluetooth-enabled device to six separate headphones. Its durability and price make it ideal for schools looking to integrate audio activities into curriculum. The tool is ideal for differentiated learning, literacy, English-language learners (ELL) or Special Needs instruction. Casio’s ClassPad.net is an all-in-one web-based mathematics resource geared for K-12 mathematics and beyond. The software takes advantage of Casio’s Natural Display technology for input and output of mathematical expressions. ClassPad.net helps kids brush up on their math skills all year-round by offering digital scratch paper students can use to help them solve problems. Education Networks of America (ENA) announced that CatchOn, Inc. has joined the ENA family of companies. The deal pairs ENA’s comprehensive infrastructure technology and support services with CatchOn’s unique software as a service tool that delivers essential data about ed tech usage in U.S. schools. Combined, ENA and CatchOn provide a rich portfolio of services to meet the demands of today’s digital schools. The solution is available directly through CatchOn or through ENA. Classcraft announced the launch of its new “Engagement Management System” (EMS), a tool for fostering systemic engagement for schools and districts. To expand its partnerships, Classcraft also launched “Quests Marketplace,” a community-based, Netflix-style center where teachers can share lessons they’ve created via Classcraft’s Quests feature, which transforms a teacher’s existing lesson plans into self-paced, interactive learning adventures for students. The Marketplace also includes free curriculum content from its partners, including Google Classroom, Newsela, and more. Discover Video today announced its new live 360 video system for streaming and recording events, lectures and training sessions. The system allows any organization to deliver live 360 4K video to viewers on computers and mobile devices. It includes a revolutionary new Insta360 camera and the DEVOS enterprise video platform. The Live 360 Video system is ideal for delivering dynamic live and on-demand video from educational institutions, businesses, healthcare organizations, government, and special events anywhere. Discovery Education announced enhancements to its Techbook series will help educators maximize instructional time by making engaging digital content even more accessible to teachers and students. New features include the Concept Resource pages, a feature that puts all digital resources associated with a lesson in one “grab-and-go” setting, an Assignment Manager to help easily assign and track student work, an upgrade to the Techbook’s internal search engine, and more. Do you have an innovative edtech product? Nominate it for the Tech & Learning Awards of Excellence Contest! Click here for details. The Encyclopaedia Britannica Group announced Britannica Insights, a free Chrome browser extension that enables searchers to cut through the noise on the internet and provide trusted and verified information. In addition to this, Britannica’s supplementary information is offered free of charge in the top-right corner of the search results page. Britannica Insights is available for free download and works with major search engines – Google, Bing, Yahoo, and others – on the Chrome browser. Extreme Networks’ Smart OmniEdge solution is comprised of a secure, unified wired/wireless infrastructure and AI-driven management capabilities. The end-to-end network edge solution provides schools with an extra layer of security to keep student information safe, easier management of IoT devices and high-performance connectivity to support BYOD, 1-1 computing and emerging styles of learning. The resulting network and insights give customers the agility to grow and adapt as business needs change, while enabling digital transformation. FreshGrade announced the upcoming release of FreshGrade for Schools. The new offering supports principals’ pursuit of improved learning outcomes, engaged students and parents, and reduced teacher workload. Teachers using FreshGrade for Schools can empower students to capture their learning through video, picture, and audio files, then self-reflect on their progress in student portfolios. Principals can access unique data insights on how teachers, parents and students are using FreshGrade through monthly reports. Fuel Education and Modern Teacher have joined forces to provide their school district partners access to Modern Teacher’s research-based methodology, the Digital Convergence Framework. The Framework helps districts address and track key steps and milestones in a unified way, integrating professional learning with district-level success metrics and milestones. The FuelEd/Modern Teacher partnership will help districts leverage digital solutions to prepare students for the 21st century by offering greater opportunities for personalized and blended learning. Generation Genius has recently launched its streaming video series, featuring Dr. Jeff Vinokur, aka The Dancing Scientist, known for his fun, funny and entertaining approach to science learning. Created in partnership with NSTA, the videos and supplementary materials (teacher guides, lesson plans, DIY activities and more) support NGSS for grades 3-5. Videos provide stopping points to facilitate classroom discussion and encourage critical thinking. Free trials and annual subscription packages are available for schools and classrooms. GradeCam introduced a futuristic new answer format powered by Aita – their proprietary Artificial Intelligence Teaching Assistant technology – that can read and score handwritten letters and words up to twenty characters in length. GradeCam can now read and grade responses that have simply been written out by hand. No bubbles required. This remarkable functionality makes an array of assessment types possible – including spelling tests, short answers, fill-in-the-blank, and more. GreyED Solutions announced their acceptance into the State Educational Technology Directors Association (SETDA) Emerging Private Sector Partners Program, which launches this month. The partnership allows companies to benefit from opportunities to showcase their products and services, receive feedback and advice, and engage in thoughtful dialogue with educational leaders. GreyED plans to share FilterED with SETDA members, a cloud-based, comprehensive tool used to view evidence and data in an easy-to-read format. Hero K12 has partnered with Clever Secure Sync for data integration. Adding Clever integration capabilities means that schools can quickly and securely synchronize data from their SIS (student information system) to Hero K12 for rapid set up of new accounts. Clever Secure Sync is used by many educational applications for seamless and secure data transfer. This makes it much easier for schools to onboard with Hero because data is made immediately available. Houghton Mifflin Harcourt announced the launch of Into Learning, a series of fully integrated, next generation core curriculum solutions rooted in learning science that combine teacher support, data driven instructional practices and focused content architecture to accelerate growth for students. HMH’s three new programs— HMH Into Math, HMH Into Reading and HMH Into Literature—feature a flexible design that combines embedded, actionable data analytics, blended professional learning opportunities and current content to inspire students. Hoonuit has introduced the first of its kind integration of student achievement data with aligned professional development. To enable the success of educators in individualizing and maximizing performance of all learners, the company has embedded educator learning experiences directly within the data visualization workflows to drive usage and adoption of data. This integration will be available in time for the new school year. Illuminate Education announces the release of Illuminate version 11.0. This newest offering builds on Illuminate’s tools to promote educator and student success by increasing the platform’s accessibility and incorporating customer feedback. Illuminate 11.0 will improve the user experience through an upgraded look and other new features, including a new menu and navigation system, an updated manual and hybrid assessment feature, cloud-ready access, eduCLIMBER integration, allowing for powerful data visualization, and more. Impero Software announced the latest version of Impero Education Pro V7. The software has been updated to include a new mental health keyword library, google authentication, and improved scalability to support larger school districts, among other features, including keyword policy management allowing districts to select keyword libraries for individual schools, additional feature enhancements to the browser-based console, MAC enhancements, SIS integration improvements, and more. Insight ADVANCE announced a collection of updates to its observation, coaching, and evaluation software. The Insight ADVANCE Suite, including ADVANCEcalibrate, ADVANCEfeedback, and ADVANCElearn, offers educators the opportunity to improve their practice and student achievement through video-based self-reflection, peer-to-peer collaboration, and coaching. State departments of education, school districts, and universities across the country now will be able to network with one another to leverage a broader set of coaching resources. Kano updated its product line, including the current Creative Computing and Computer Science Curriculum plans, as well as new tools targeted to educators including design challenge cards, a professional development series and design challenge student workbooks. 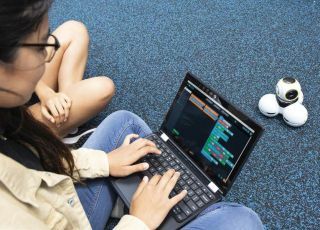 The Creative Computing and Computer Science curricula each include a fully developed lesson plan framework to help educators integrate computing and coding into learning spaces. The plans are a unique mix of teacher-led structure and student-led learning. LEGO Education announced U.S. LEGO Education Master Educators, a new community of early learning through high school educators, and that the program will soon open to educators worldwide. Educators from local school districts across the U.S. applied to join the voluntary ambassador program. Master Educators use LEGO Education solutions in their classrooms and embody the LEGO Education mission of enabling success for all students through hands-on learning experiences. Lenovo launched LanSchool Air, a cloud-based classroom orchestration platform that helps teachers keep students engaged in a safe online environment and has several features. Push website allows teachers to instantly launch a webpage on every classroom device; thumbnail monitoring gives teacher thumbnail views of all student screens; web limiting restricts students to approved sites; blank screens lets teachers lockdown keyboards, screens, and mice with one click, and Snapshot lets teachers take screenshots of student screens. Lexia Reading Core5 (Core5) will integrate directly with Schoolwork, a powerful new iPad app from Apple that helps teachers create assignments and handouts, see student progress and tap into the power of apps in the classroom. The combination of Core5 and Schoolwork will streamline the classroom workflow, make it easier to distribute and collect instructional materials, and provide educators with useful and timely insight into each student’s progress to ensure learning is taking place. Microsoft Education made some announcements in STEM education, including an Aquatics Update for Minecraft: Education Edition and a new collection of teacher-written, inquiry-based lesson plans in partnership with BBC Learning to compliment the BBC Earth and OCEANX film, Oceans: Our Blue Planet. The MR Limitless Libraries Fund is a grant program designed to help foster mixed reality adoption in education and is opening up applications to middle and high schools, as well as public libraries. Microsoft Corp. announced it has acquired Flipgrid Inc., a social learning platform used by over 20 million Pre-K to PhD educators, students and families worldwide. Microsoft will also be making Flipgrid free for schools so it’s easy for any school to utilize the software. Customers who purchased a subscription from Flipgrid will receive a prorated refund. New Flipgrid updates will launch and be livestreamed from Minneapolis on August 1 at Flipgrid’s annual educator conference, #FlipgridLIVE. Newark element14 is providing kits to help students learn the fundamental skills of coding, including the Codebug, BBC micro:bit, and the Arduino CTC101 classroom kit. Codebug (ages 7+) and BBC micro:bit (ages 11+) are small coding devices that are interactive and easy to use. The Arduino CTC101 is a modular program for students 13-17 that teaches the foundations of programming, electronics, and mechanics through a series of playful, well-documented projects and easy-to-assemble experiments. Panopto has announced a new public specification that enables organizations to consolidate disparate video collections into secure, centralized repositories. Panopto has also further enhanced its video content management system with new features focused on video curation and interactivity. These additions include a feature for departmental homepages for departments to curate their own landing pages and increased interactivity with videos, such as support for threaded discussions and video quizzes with embeddable video players. RealNetworks, Inc. announced the free and immediate availability of SAFR for K-12, an AI and machine learning based facial recognition solution to help enhance safety in over 100,000 K-12 schools in the United States and Canada. At no cost, and for the first time, K-12 schools can now apply state-of-the-art facial recognition technology to better protect the school environment. SAFR for K-12 can be downloaded by schools beginning today from the link posted above. Symbaloo announced the release of Symbaloo workspaces. These will allow all teachers and students to collaborate through a suite of new features, saving teachers time by providing them a way to easily select, organize, and blend online resources. Schools and districts can compile webmixes, or collections of resources and Learning Paths, into a private gallery. Learning Paths are sequenced tiles in a board-game style that help educators create lesson plans, deliver assignments, and personalize learning. TechPilot labs launches ChromeTools after months of public beta. ChromeTools is a cloud-based classroom management solution providing a variety of tools that allow teachers to monitor and keep students on-task when using Chromebooks in the classroom. Tools include Class View, Screen View, Screen Lock, Tab Control, Site Lock, and a custom blacklist for teachers to block a custom list of sites. Teachers access the system using their regular school Google login account. TypingMaster announced TypeTastic School Edition, introducing students to over 250 entertaining new keyboarding activities that cover touch-typing and fluency, numbers, and symbols. Varying exercises are designed to support learning every step of the way, and the FingerPaths keyboard helps students intuitively visualize key locations and finger movements. TypeTastic School Edition also includes original games that help students play their way into typing in just a few hours while having fun. Vernier Software & Technology launched Coding with mBot: Self-Driving Vehicles activities module written for the mBot by MakeBlock. The module helps students program mBot to mimic many self-driving car actions, including automatic lane changes and autonomous parking. Students will build upon their basic coding and troubleshooting skills as they progress. Different versions of activities are available for older students using the Scratch-based mBlock software and for younger students using the mBlock app for mobile devices. Waggle announced a strategic partnership with Amplify. The partnership combines Waggle’s renowned AI-driven practice and preparation solution with Amplify’s story-driven Fractions, Vocabulary and Close Reading content. The result is an integrated solution designed to maximize students’ growth in key Math and ELA subject areas. Waggle will incorporate Amplify’s immersive programs into its personalized learning library for Fall 2018, providing students and teachers with media-rich, standards-based tools to drive achievement. 7 Mindsets announced a new portal to house its curriculum and SEL facilities for teachers to use. The portal provides an easier way for teachers to connect with their students. The following features are now available: Curriculum for staff meetings; A parent portal with best practices; A resource hub; Self-paced professional development; A list of 10 core competencies, and more. The platform continues to focus on the curriculum’s three key areas: simplicity, flexibility, and connection. Curriculum Pathways (www.curriculumpathways.com/portal/) announced Crio, a new free software program that puts the audio, text, images, video and interactive content of Curriculum Pathways into the hands of educators. Features include a lesson guide area to provide notes, strategies and additional resources for the creator, or other educators using the lesson; customizable feedback; a portfolio for students to save, manage and send their work; options for embedding and sharing lessons, integration in learning management systems, and more. KinderLab Robotics (kinderlabrobotics.com) announced Free Throw, a throwing-arm attachment that lets the KIBO robot toss ping pong-sized balls. With the attachment, students can code KIBO to drive to the basket and shoot, hit a target, and play games like basketball, quidditch, lacrosse, and corn-toss. Children can experiment with different throwing options, re-load the Free Throw, and launch again. A variety of free activities linked to Next Generation Science Standards are downloadable from the KIBO Resources website. Epson (www.epson.com/education) introduced the PowerLite Pilot 3 Projector Connection and Control Box, a convenient wall-mounted A/V solution for Epson short-throw and ultra short-throw projectors. Designed to support an array of devices, the PowerLite Pilot 3 helps educators maximize cable management, control classroom projectors, and streamline source switching and volume control. The PowerLite Pilot 3 provides consolidated cable management, streamlined control of classroom A/V devices, and 3x HDMI control buttons (including 1 MHL). POWERUP Toys (www.poweruptoys.com) announced their new aeronautic classroom kits. The POWERUP 2.0 gives paper airplanes battery powered flight and the POWERUP 3.0 allows students to control their paper airplanes via a Bluetooth connected device. The 2.0 Classroom Kit comes with either 4 or 24 units and the 3.0 Classroom Kit comes with 4 units. Kits include a downloadable teacher’s guide and access to FlightDeck, an online lesson community. Surface Go (www.microsoft.com) is the smallest, lightest Surface yet, having a sleek design that aids portability without compromising performance. It features 10” high-resolution PixelSense display, Windows Hello, pen and touch capabilities, and an Intel Pentium Gold processor, all packaged in a device weighing only 1.15 pounds. Schools purchasing in the commercial channel can select either Windows 10 Home in S mode or Windows 10 Pro to fit the needs of their classrooms and goals. RoboKind (robokind.com) introduced Jett, the coding and programming robot, along with the robots4STEM curriculum designed to teach all students, including those with disabilities, the skills they need to ignite a lasting interest in STEM. Jett provides all students, including those with autism spectrum disorder (ASD), the opportunity to explore STEM, coding, and programming, including an entire curriculum of ready-made lessons that don’t require teachers to become coders or have any previous experience or background with coding. Osmo (www.playosmo.com/education) launched a new Osmo case and base for iPads at ISTE 2018. The base has a universal device slot that fits almost any iOS device, including iPad Pro 12.9. This device compatibility makes using Osmo convenient for BYOD classrooms and it decreases set-up time because students simply click their devices into the base and start using Osmo apps immediately. The base also supports device charging, allowing students to learn while the device charges. SMART Technologies (www.smarttech.com) showcases the latest SMART Board interactive displays at InfoComm and ISTE. Ideal for active learning and collaborative spaces where users need quick and simple access to show, share and interact with content, SMART Board 7000 and 6000 series combine an Intel Compute Card with Microsoft Windows 10 Pro and Android-based iQ embedded computing directly in the display. SMART is also showcasing its newest MX series interactive display, featuring the essentials that educators need. UKIT (www.ubtrobot.com) is a new robotics kit that ties STEM literacy into each unit of the curriculum through a literacy prompt that contextualizes lessons and applies them to the real world. Yanshee is a humanoid robot that combines an advanced AI interface, a programmable Raspberry Pi card, and a host of sensors and functionalities to create the ultimate open-source platform for teachers and robot enthusiasts to learn, experiment, research, and have fun. The Flex Active Flip Table (www.spectrumfurniture.com/en/special/flex-active-flip-lp) creates more classroom space with its easy storage and nesting capabilities. It is available in different widths, worksurface depths, and is ADA compliant. Its locking casters enable easy room configuration and help make storing the Flex Active Flip Table a simple task. The table’s one step release allows the top of the table to flip. It is now possible to flex your space with the Flex Active Flip Table. Yamaha (www.yamahaproaudio.com/global/en/products/pasystems/) announced the new Yamaha STAGEPAS 400BT/600BT portable PA systems, ideal for schools, lecture halls and conference centers. This system features two lightweight speakers and a detachable powered mixer, a pair of speaker cables, and a power cord for a complete portable sound solution that can be set up easily in virtually any environment. Other features include streaming stereo audio from any Bluetooth-paired device, one-knob Yamaha Master EQ sound optimization, 400-680 watts, and more. Acer America (www.acer.com) announced an alliance with Wonder Workshop (education.makewonder.com) to deliver unique STEAM bundles in the United States that teach K-8 students coding, robotics and computer science as part of their STEAM initiatives. The bundles pair Wonder Workshop’s Cue, Dash and Dot robots with Acer Chromebooks, Chrome tablets, Window notebook PCs and Android tablets. Elementary and middle schools can choose from various bundles offered by Acer and Wonder Workshop including age-appropriate robotics tools, accessories, and more. Canon (www.usa.canon.com/internet/portal/us/home), in collaboration with Silhouette America (www.silhouetteamerica.com), introduced the PIXMA G3200 MegaTank All-in-One printer, a device that can create 3D educational models utilizing 2D prints. The collaboration will include a library of 250 Canon Creative Park crafts that are processed to work with the Silhouette fabricator after being printed on the Canon printer so that students can immediately immerse themselves into the assembly of fun learning crafts, providing a fast method for producing 3D crafts. BenQ America Corp. (www.BenQ.com) displayed the 70-inch RM7501K interactive flat panel (IFP) and the 75-inch RP704K IFP at ISTE 2018. Both displays feature BenQ’s smart Eye-Care solution, which automatically activates Low Blue Light and flicker-free technologies through an embedded motion sensor. The touch-enabled 4K UHD Google Jamboard lets students draw, annotate, import and scribble on images and Google Docs, search the web, communicate with classmates via Hangouts, and more, while saving all this in the cloud. Bretford (www.bretford.com) is introducing additions and upgrades to its family of mobile device charging products at ISTE 2018. TechGuard Connect charging lockers offer expanded features including an integrated 5” touchscreen, an easy-to-use interface, RFID-powered check-in/check-out functionality, and more. Other new Bretford products on display at ISTE include: Juice Mobile Power, a mobile power system with FLI Charge technology, and CUBE Toploader and CUBE Toploader Mini, charging stations, carts and trays that now feature top-loading options. Capstone’s (www.pebblego.com) K–2 online resource PebbleGo announced its release of expanded Spanish materials. The new offering, contextually translated to maintain proper academic vocabulary and supported by natural voice audio, will begin to roll out later this fall. With this expansion, PebbleGo’s Science, Social Studies, and Biographies modules also have Spanish counterparts. Students at schools that subscribe to both the English and Spanish language versions can toggle between the two at the article level. Crestron (www.creston.com) demonstrated its new Crestron AirBoard network whiteboard capture device at InfoComm 2018. Crestron AirBoard enables both local and remote participants to see whiteboard content on the main room display and on their personal display device, and then share it with the touch of a button. Crestron AirBoard is simple to operate and easily mounts above any surface using the included mounting kit.